Hundreds of classes have been canceled and dozens more relocated as a strike by graduate employees at the University of Illinois Urbana-Champaign continues into a second week. On Tuesday night, graduate workers occupied the office of university president Tim Killeen. Strikers have a variety of demands, but one of the most contentious points focuses on the future of tuition waivers — and whether some graduate workers will have to pay tuition while employed in academic positions on campus. Strike captain and graduate employee Liz Matresse attended a rally of the Graduate Employees’ Organization (GEO) at the Urbana campus’ main quad during the first week of the union’s strike. About a hundred people, mostly members of the graduate worker union, gathered to call attention to the walk-out. Many beat on bucket drums, jangled bells and wore bright yellow and blue beanies with the letters “G-E-O” embroidered on the front. Matresse said one of the reason’s she’s striking is because she’s in favor of tuition waivers for all graduate employees. She said she never would have come to the university had a tuition waiver not been a part of her enrollment package. “I would have just said no. I said no to other places that didn’t offer me tuition waivers,” she said. Matresse is working on a PhD in medieval literature, and she said she loves teaching. The Spokane, Washington native said her father is a retired social worker and her mother is a teacher. Matresse said she lives on a stipend totaling roughly $18,000 per year. Without a waiver, she estimates she’d have to pay about $30,000 for tuition. Even with the waiver, she said it’s tough to sustain herself on the stipend. Tuition waivers are commonplace on university campuses across the country. Last fall, many grad students and universities advocated to protect tuition waivers from being taxed under the federal tax overhaul. Those efforts succeeded. Waivers are often used as an employment perk, not only for graduate students, but for other university employees as well. Vice Provost Bill Bernhard says the waivers benefit the Urbana campus, too. “It’s an invaluable tool to attract the best graduate students. If we didn’t have this, a lot of graduate students couldn’t afford to come to study,” he said. Better graduate students can also attract better faculty members. Dana Rabin, a history professor and president of the Campus Faculty Association in Champaign, said she relies on graduate workers to help with research projects and teaching. Rabin said she supports the GEO’s cause. She’s worried that if the campus administration moves to limit tuition waivers, exceptional prospective graduate students from low- and middle-income backgrounds may not be able to attend the school. Campus administrators, however, say they want to keep tuition waivers intact, but they also want more control over who gets them. Bernhard said that PhD students receive tuition waivers because it’s too great a financial burden for the vast majority of students to pay for tuition over the four to six years it takes to earn the degree. But the university also offers “revenue generating” master’s degree programs in which graduate students are expected to pay tuition. Under the language of the prior GEO contract, any graduate employee, regardless of what program they’re enrolled in, who received a teaching or graduate assistant position was entitled to a tuition waiver, he said. In that scenario, departments that are supposed to be earning tuition money lose out on that revenue, Bernhard said. Also, he said, the university is dealing with state cuts to higher education. He said that fact is looming in the minds of administrators as they negotiate with the GEO. Bernhard said the campus wants to give more power to faculty members to decide who gets a tuition waiver based on the discipline and market demand for the degree program. 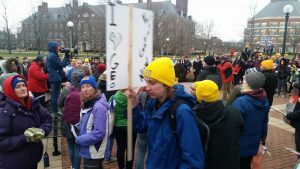 GEO co-president Gus Wood has led numerous rallies around campus to call attention the strike. He’s working on a PhD in history. Wood said it doesn’t matter that the administration has promised to protect waivers for some graduate employees. He believes that no graduate employee should have to pay to work at the university in an academic position. If the campus manages to win this fight, Wood fears that only the wealthy will be able to attend graduate school. More than 400 classes were cancelled in the first week of the strike. The GEO’s contract expired in August and they’ve been in negotiations with the campus for nearly a year. 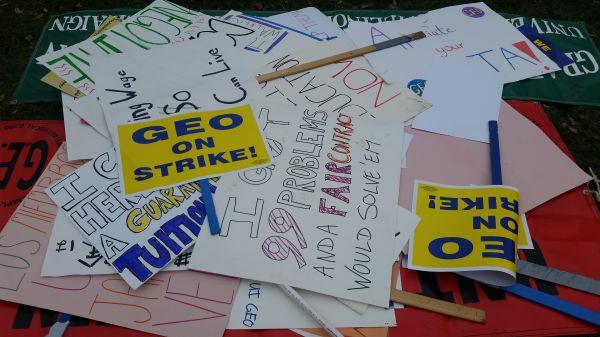 The union says this is the longest strike in the GEO’s 16-year history. 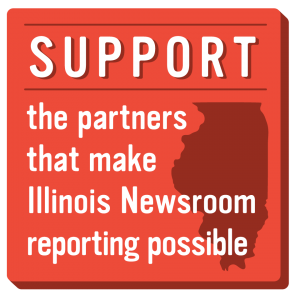 Illinois Newsroom is a regional journalism collaborative (RJC) focused on expanding coverage of education, state politics, health, and the environment. The collaborative includes Illinois Public Media in Urbana, NPR Illinois in Springfield, WSIU in Carbondale, WVIK in the Quad Cities, Tri States Public Radio in Macomb, WTVP in Peoria, and Harvest Public Media. Funding comes from the stations and grants from the Corporation for Public Broadcasting (CPB) and McCormick Foundation.